ChemSee’s dosimeters for toxic gases are simple, low-cost dosimeters which alert employees to excessive exposure via simple color changes. These dosimeters can be fixed to an employee’s lapel, or hung on a wall to monitor room conditions. Electronic readers are available which work with ChemSee’s full range of dosimeters, allowing for quantitative analysis and record keeping are available for clients who require regular or continuous monitoring. The Dosimeters and Electronic Readers use passive, colorimetric reactions to accurately determine the amount of gas exposure that has occurred in a given time period. 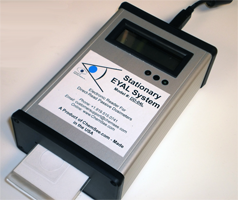 The Wireless and Stationary EYAL systems allow for quantitative analysis of this exposure. 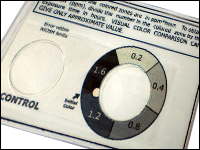 An example of a dosimeter detecting chlorine is shown below. A wide range of dosimeters are available for specific toxic industrial chemicals. 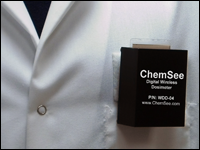 ChemSee’s dosimeters are small and lightweight (about the size of a business card). More information on ChemSee Badge Dosimeters. ChemSee’s electronic readers can be used to record an employee’s quantitative exposure throughout the course of a day. Wireless and Stationary Systems are available.